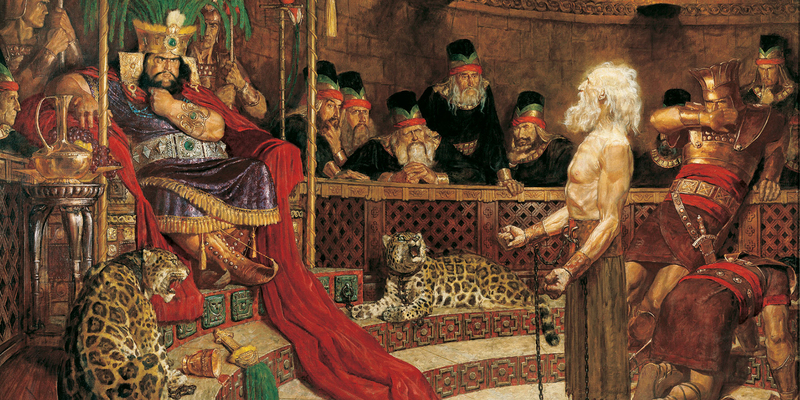 Abinadi Before King Noah, Arnold Friberg. Image via lds.org. Given this background, the exchange between Abinadi and the priests begins to make greater sense. Noah’s priests were not just quizzing Abinadi on his scriptural knowledge; they were looking for a legal cause of action “wherewith to accuse” Abinadi. False prophecy being a capital offense, those found guilty of it were worthy of death (Deuteronomy 18:20). It is in response to this charge that Abinadi quoted Isaiah 53, thereby supplying the fuller context of the passage used by the priests. Abinadi followed by expounding upon both Isaiah 52 and 53 as he testified of the Redeemer (see Mosiah 13–16).7 His exposition was legally relevant and textually persuasive. This is an interpretation from a Jewish source nearly contemporary with Abinadi that includes both the prophets and “the anointed one” (the “messiah” in Hebrew).10 Although the Dead Sea Scrolls author was applying this to Melchizedek, Dana Pike pointed out that Melchizedek is a type of Christ.11 Furthermore, just as Melchizedek is called the “king of Salem” (in Hebrew, “king of peace”; Genesis 14:18; cf. JST Genesis 14:33; Alma 13:18), Abinadi describes the Redeemer as “the founder of peace” (Mosiah 15:18; cf. Isaiah 9:6). Although the priests did not interpret the text this way, Abinadi demonstrated that the passage did not necessarily apply to Noah and his people, as they likely thought (Mosiah 13:27–35). Abinadi’s argument was thus linguistically sophisticated and theologically impressive. In the end, the priests’ charge of false prophecy did not stick, and after coming up with yet another charge, that of blasphemy, which Abinadi also withstood (Mosiah 17:7–8), Abinadi was finally executed for having reviled against the king (Mosiah 17:12; see Exodus 22:28).12 Thanks, however, to the priests’ accusation of false prophecy, readers today can ultimately benefit from, learn from, and cherish Abinadi’s inspiring explanation of Isaiah’s words as well as Abinadi’s testimony of the redeeming power of the Atonement. That was a testimony which Abinadi sealed with his blood (Mosiah 17:12–20). John W. Welch, The Legal Cases in the Book of Mormon (Provo, UT: BYU Press and the Neal A. Maxwell Institute for Religious Scholarship, 2008), 139–209. David W. Warby, “The Book of Mormon Sheds Light on the Ancient Israelite Law of False Prophecy,” Studia Antiqua (Summer 2003): 107–116. John W. Welch, “Isaiah 53, Mosiah 14, and the Book of Mormon,” in Isaiah in the Book of Mormon, ed. Donald W. Parry and John W. Welch (Provo, UT: FARMS, 1998), 293–312. 1. This is a common reading of the passage from several commentators. See, for example, Monte S. Nyman, “Abinadi’s Commentary on Isaiah,” in Mosiah, Salvation Only Through Christ, ed. Monte S. Nyman and Charles D. Tate Jr. (Provo, UT: Religious Studies Center, Brigham Young University, 1991), 161; Kathryn Jenkins Gordon, Scripture Study Made Simple: The Book of Mormon—Complete Text and Commentary in a Single Volume (American Fork, UT: Covenant Communications, 2015), 200. 2. David W. Warby, “The Book of Mormon Sheds Light on the Ancient Israelite Law of False Prophecy,” Studia Antiqua (Summer 2003): 107–116. 3. John W. Welch, “Isaiah 53, Mosiah 14, and the Book of Mormon,” in Isaiah in the Book of Mormon, ed. Donald W. Parry and John W. Welch (Provo, UT: FARMS, 1998), 294; John W. Welch, The Legal Cases in the Book of Mormon (Provo, UT: BYU Press and the Neal A. Maxwell Institute for Religious Scholarship, 2008), 176–177. 4. Welch, “Isaiah 53, Mosiah 14, and the Book of Mormon,” 294; Dana M. Pike, “‘How Beautiful upon the Mountains’: The Imagery of Isaiah 52:7–10 and its Occurrences in the Book of Mormon” in Isaiah in the Book of Mormon, 264. Welch, Legal Cases, 176 provides several additional examples of contrasting ideas and imagery in Abinadi’s message and Isaiah 52. 5. See Book of Mormon Central, “Why Does Nephi Always Go Down to the Wilderness, and up to Jerusalem? (1 Nephi 3:4),” KnoWhy 6 (January 7, 2016). Welch, Legal Cases, 176: “This passage of scripture quoted to Abinadi by the priests could very well have been one of the theme texts that had been used often by Zeniff’s colony as the rejoiced over their redemption of the land of their inheritance and temple like Solomon’s.” Also see Welch, “Isaiah 53, Mosiah 14, and the Book of Mormon,” 300. 6. Welch, Legal Cases, 176. 7. Welch, “Isaiah 53, Mosiah 14, and the Book of Mormon,” 295–305; Welch, Legal Cases, 177–179. 8. Pike, “How Beautiful upon the Mountains,” 276–279; John A. Tvedtnes, The Most Correct Book: Insights from the Book of Mormon Scholar (Springville, UT: Horizon, 2003), 164–166. 9. Translation from Geza Vermes, The Complete Dead Sea Scrolls in English (New York, NY: Penguin Books, 2004), 533, emphasis and ellipses in the original. 10. Pike, “How Beautiful upon the Mountains,” 278. 11. Pike, “How Beautiful upon the Mountains,” 278–279. 12. Welch, Legal Cases, 200.